Update: This article has been updated with more information. Read on for further benchmark results for both the MacBook Air 11″ and 13″ models. The above results are from the GeekBench program. In short, the new MacBook Air 13″ model with a 1.86ghz processor performs at roughly 80% of the performance of a MacBook Pro 13″, while it’s little brother the new MacBook Air 11″ reaches roughly 60% of the MacBook Pro 13″ performance. The results aren’t too surprising considering the slower processor clock speeds and half the shipped RAM, but remember that GeekBench scores do not take into consideration GPU or SSD performance. The flash based memory of the new MacBook Air makes working with the Air actually feel snappier with things like booting and launching applications, despite running at a slower clock speed than it’s beefier Pro cousin. Using a faster hard drive can make a machine feel significantly faster, and it’s a recommended upgrade to existing MacBook Pro machines because of this. As you can see, the new MacBook Air fairs better in these tests, with the new 13″ model performing at a similar performance level of the MacBook Pro 13″. These gains are almost certainly the result of the high speed SSD drive. The benchmarks reiterate my view of the new MacBook Air: it’s a wonderful lightweight travel companion and general purpose machine perfect for most user tasks. If you really need to be performing hardware intensive work, you should jump to the MacBook Pro 13″ line for performance and portability, or the MacBook Pro 15″ for powerhouse portable computing. It’s not fair to compare MBA with MBP, it’s a netbook. The Air is NOT a netbook why do people insist on calling it one? Because it’s lightweight? The difference is the Air is a real computer, a netbook is a portable cheap toy. 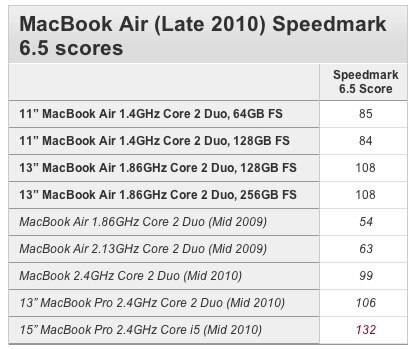 Look at the MacWorld benchmarks, the Air outperforms the Pro in some tests, can a netbook do that?